This is a basic troubleshooting guide for users to try and find the cause of issues. Following the guide should allow you to hopefully fix the issue, or at least figure out the source that is causing it so that when posting on the forum users have more information available to offer help. Are you running the latest version of Maxthon? Check the forum for any new releases and update/reinstall. Most issues will generally be resolved in new builds, or just by the reinstall process. Also ensure you have the latest version of Flash and any other plugins you might be using. If an update/reinstall doesn't work, try doing a clean install which removes all userdata during the uninstall process. Your userdata will be restored if you are using a Maxthon Passport. 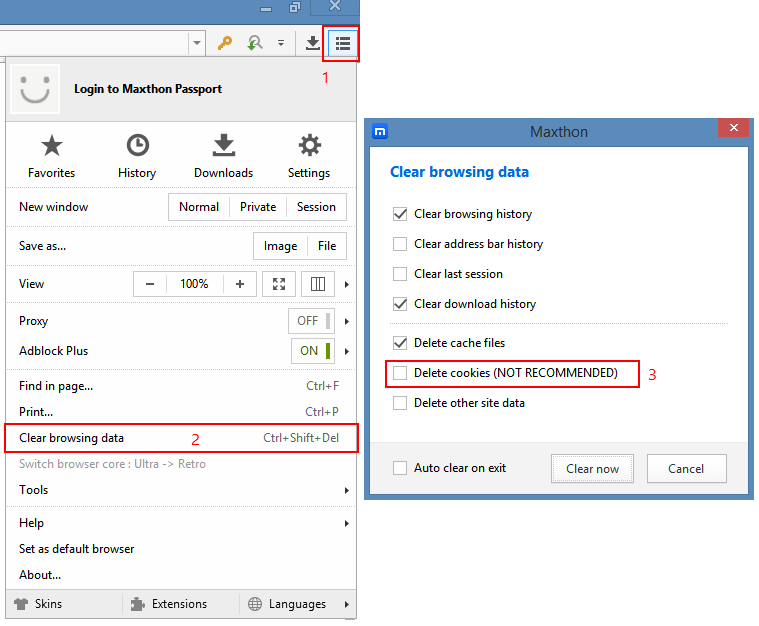 If you're using a local/guest account, make sure you have a backup of your Maxthon userdata folder (Open an explorer window and type %appdata%\Maxthon5\Users\guest into the address bar). Keep a copy this folder, then copy it back once you have reinstalled. Chances are someone has had the issue before you and a fix has been found. If you find a solution that works, reply in the thread so others know that it has worked for other users as well. Try changing to Retro Mode. A great feature of Maxthon that allows you to view a site using the Internet Explorer renderer in case the site has issues with Blink. Main Menu > Tools > Switch Browser Core, or press the lightning button on the right of the address bar so it changes to a blue e icon. (Eg. unable to resolve domain name or can't connect error) try with another browser to see if it also has the same issue. Use a site like http://isup.me to check that the site is in fact online. Also check there isn't a problem with your DNS servers. You can try testing with Google (8.8.8.8) or OpenDNS (208.67.222.220) servers. And always provide a link to the site/page in question when posting so others can check to see if the problem is more widespread. Sometimes overly aggressive blocking can cause issues on a site. If this fixes the problem some of your rules may need to be revised. Post on the forum and someone should be able to offer a solution. There might be a corrupt or invalid cookie causing the problem. Deleting them will ensure new ones are created. NOTE: Only option 1 is recommended. Options 2 & 3 are only for advanced users. If disabling extensions fixes the problem then one of your extensions is causing the problem. Enable them one by one testing after each until you find the one causing the problem. Ensure you are using the default User Agent (should be unchecked), check with GPU acceleration on/off, and ensure that "Allow all sites to run plug-ins is enabled" if trying to troubleshoot a plugin related problem. These can be found by going to Main Menu > Settings > Advanced. If the above steps don't resolve the issue, follow the next steps which should help determine if the problem is with Maxthon, your account settings or system related and hopefully lead to the cause of the problem. Sign out of your Maxthon Passport. Check to see if the same problem still occurs. If not signing in fixes the problem, then it's more than likely a settings related issue. Disable all sync options from the menu then enable them one by one, testing for the problem until it occurs again. Once you know which settings are causing the issue make a post on the forum with the details for further assistance. Download & extract to any folder, run, check for the issue. DO NOT SIGN IN to your Maxthon Passport account. If this works then it's more than likely related to your install. Doing a clean install should fix the problem. - And if applicable link some screenshots or video if it will make things easier for others to understand the problem. Note #1 - CookieSpy is no longer developed or supported by the creator. The files are provided for your use, but no responsibility is taken for any loss of data or issues caused by it's use. To help the Maxthon developers find the cause of crashes, you can send crash reports found in the %temp%\MaxthonCrashData folder. Open a Windows Explorer window and type the path into the address bar. You can also make a post on the forum. First test with Retro mode. Ensure the "Allow all sites to run plugins" option is checked in the Advanced Settings page. For information on getting the most recent version of Adobe Flash working with Maxthon, please see this thread. - Go to the Application tab, click the Clear storage item. 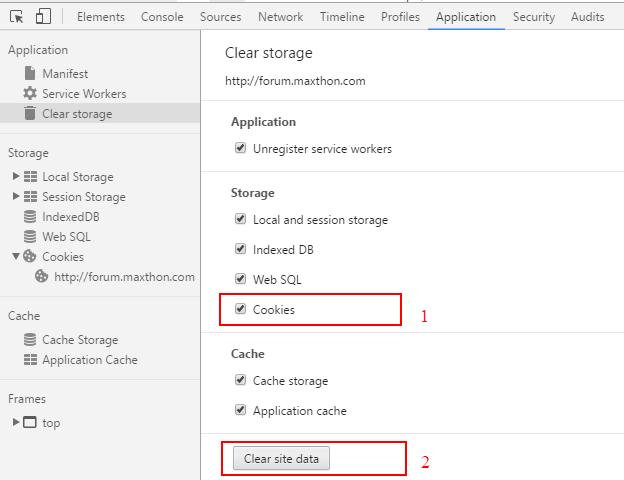 - Ensure at least the Cookies option is selected in the right pane. - Click the Clear site data button. - You can also right-click on the site address under Storage > Cookies and select Clear. - Go to the Resources tab, then the cookies section. - Right-click on the address you would like to clear cookies from and select Clear. - You can also select individual cookies if required in the right pane. Maxthon doesn't offer an option to disable address bar auto-suggestions. To manually disable this feature follow the instructions below. Open Notepad with administrator privileges, add the following line to your HOSTS file and save. Rename (or delete) the original update.db file (see image below). Restart Maxthon and the auto-suggestions won't show up. note 1: This change won't affect anything else except any other programs that use that address for the same suggestions. All it does is tell the browser the IP address for that URL is the localhost address instead of the correct one, so nothing leaves your computer. note 2: The only caveat is that when typing in the address bar it seems the matched URLs are a little slower than normal. Not 100% on that, but that's what it feels like. And of course i'm unaware of anything else it might break.